I’ve been in a bit of a knitting funk of late… I cannot get any motivation to work on my sweater, and even my socks languish in a ziploc bag somewhere… a combination of nasty, weird weather and a longing for spring, combined with a truly busy schedule. So what better to cheer me up than a trip through this book? I remember my teenaged years. I was not unpopular, but neither did I exactly fit in with the A crowd. This may have been caused in part by my clothes – to put it simply, I dressed as though this pattern book were au courant. And while in today’s vintage friendly culture this might be tolerated, let us do keep in mind that I went to high school at the height of the grunge period of fashion. Something about traipsing about wearing a pencil skirt and pearls while all your peers are wearing couderoys and boiled wool clogs does not get you asked to the homecoming dance, is all I’m saying. I, of course, only listened to classical music and musical theater of an earlier vintage, so I had no idea what this “grunge rock” thing was all about. 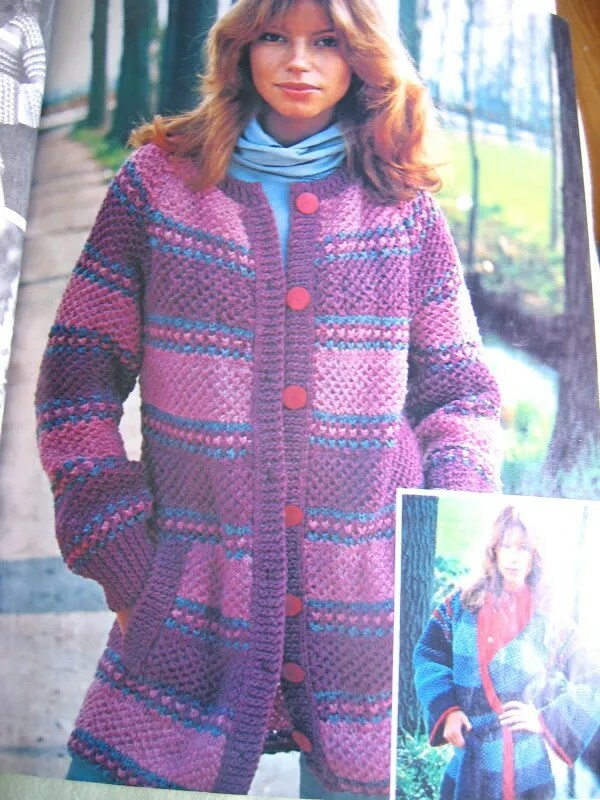 Needless to say, I wished I could have found a nice boy, willing to wear oddly patterned cardigans like the one above. 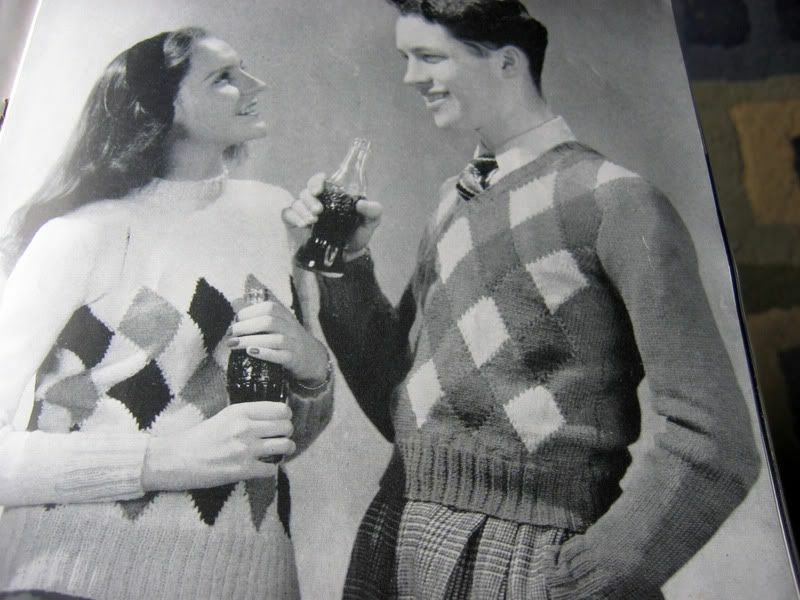 And perhaps take me out for a coke, where we would wear our coordinating argyle sweaters (and I would ignore the faux pas of his plaid pants!) Of course, the next thing you know, the other girls have noticed his style! 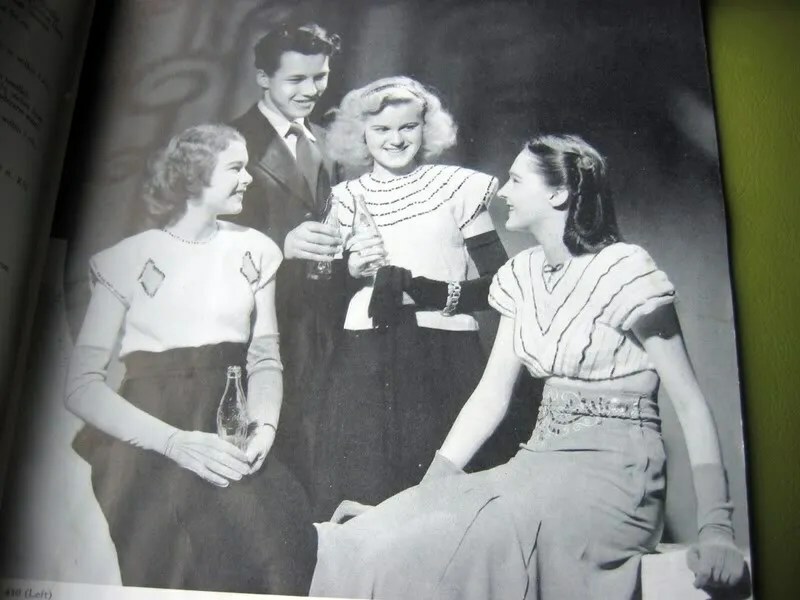 The caption over this photo reads “IT’S SMART!… So Hand Knits Go Formal!” I actually had to check, but the blouses are knitted, at about 8 st/in. 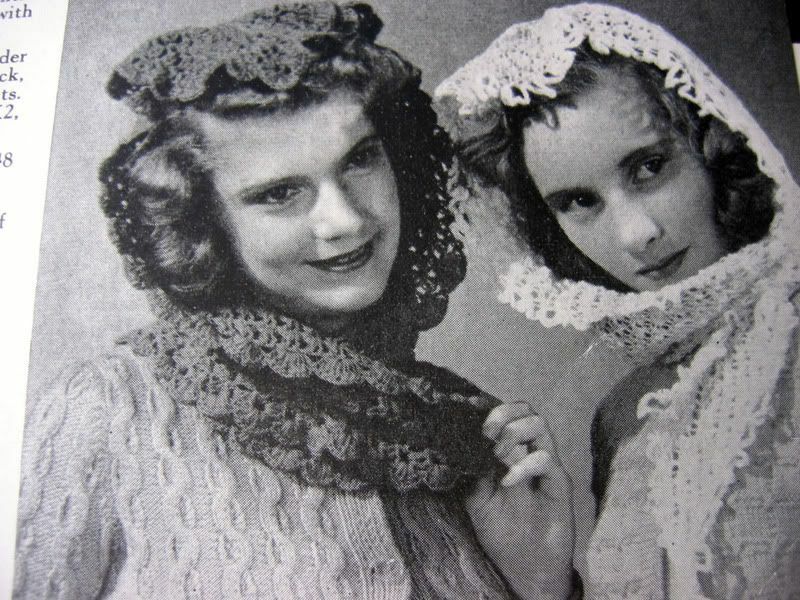 I love the gloves… it is impossible to wear gloves like that now without looking like you are just trying too hard, but oh how I wish we could! Really, isn’t that a lovely inscription? Click here to read about the battle mentioned above. There is also a fair amount of skiing going on usually, something you don’t see in modern books. I do not ski, as I am very risk averse, but I’m sure many people still do! The slippers, by the way, are called “After ski socks,” which I love. I would like a pair, I think, though I would wear mine instead in our sub-arctic kitchen, where it is always cold. 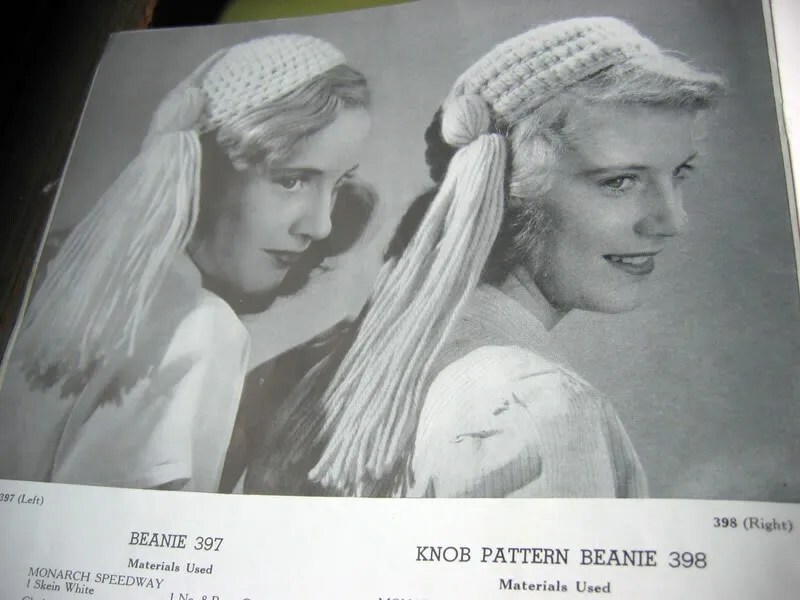 Being a book about knitting for teenagers, naturally some accessory patterns are included. There is something sinister about the one on the left, don’t you think? The back of the book. 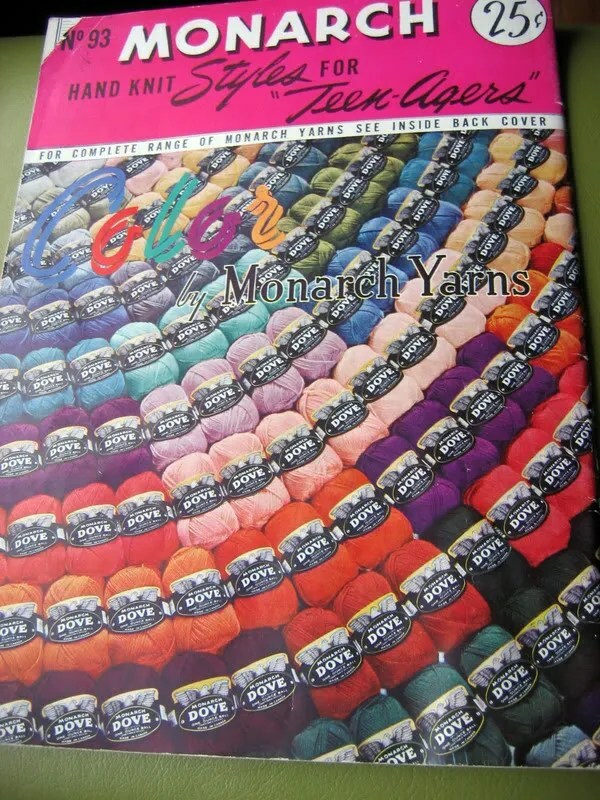 Somehow I have a hard time imagining the knits from the book in colors, but look what a lovely range of shades Monarch carried in their “Dove” yarn! This book is not my favorite, stylewise, but I think it is notable that books like this – aimed at teenagers – existed. I own others aimed specifically at preteens. I also enjoy the wholesome look at teenagers, whether true to life or not. 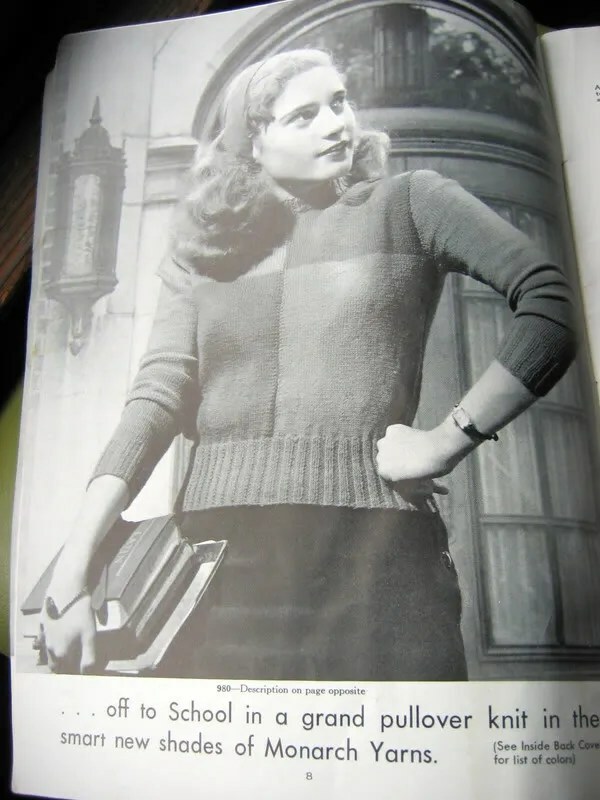 I leave you with this… off to school in a grand pullover, knit in the smart new shades of Monarch Yarns. We should all use the words “smart” and “grand” more often, don’t you think? 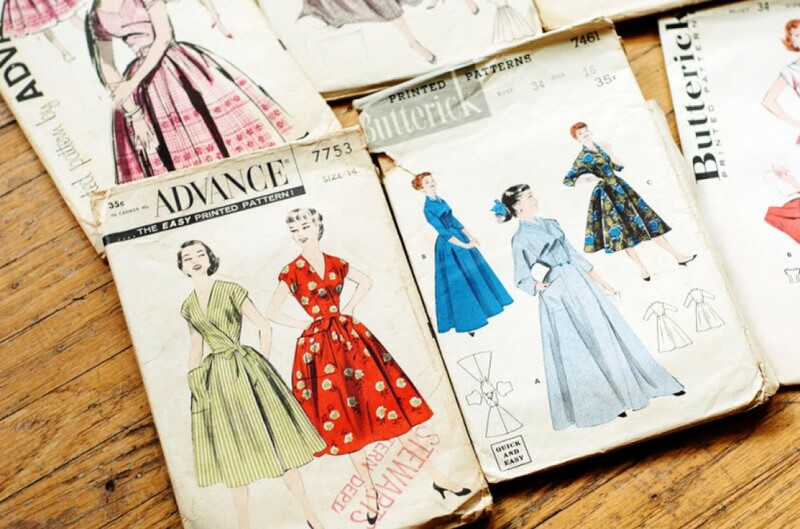 Over time I have gathered oodles of vintage pattern books, from the 1920s-1980s. This past week I happened upon an enormous treasure trove of them at a thrift store (the results of a closed store in town) and thought I might like to start sharing them with you! 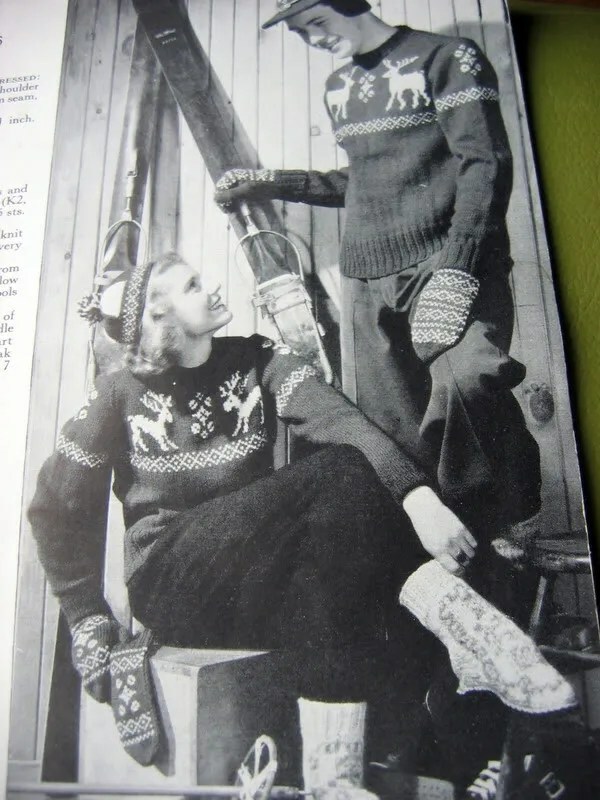 Most of these are easy to find on Ebay, should you feel an urge to knit any of the sweaters. 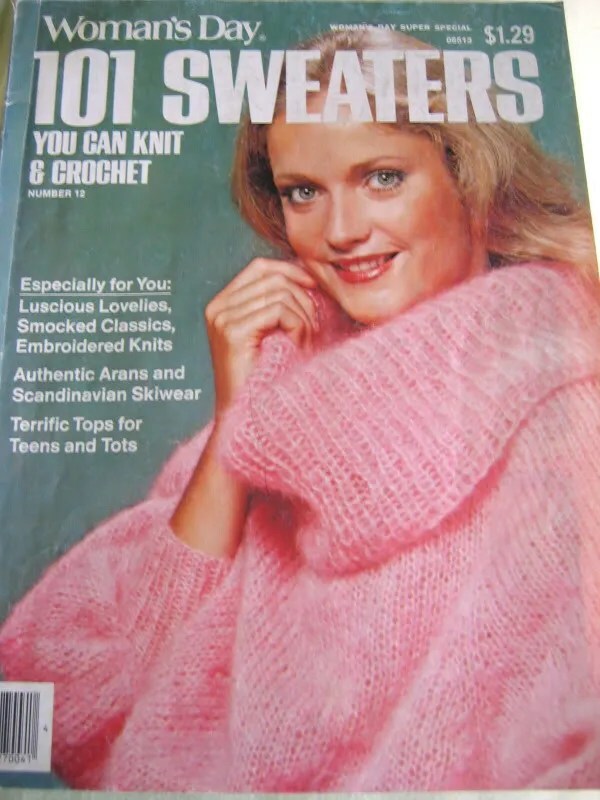 Today’s magazine comes from 1979 – 101 Sweaters Vol 12, produced by Woman’s Day magazine. My grandma was a subscriber to Woman’s day, so I have inherited tons of these. 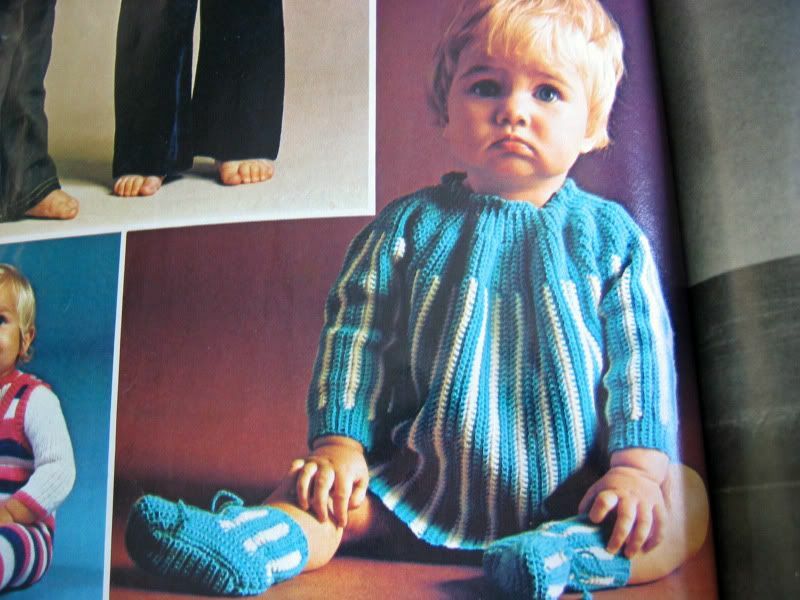 I sometimes think that the 70s get a bad rap – after all, it wasn’t all rainbow striped ponchos and macrame. I love 70s sitcoms such as the Bob Newhart show and Mary Tyler Moore, and I often admire the clothing worn by the female characters. Also, I was born in 1979, so it can’t be all bad! 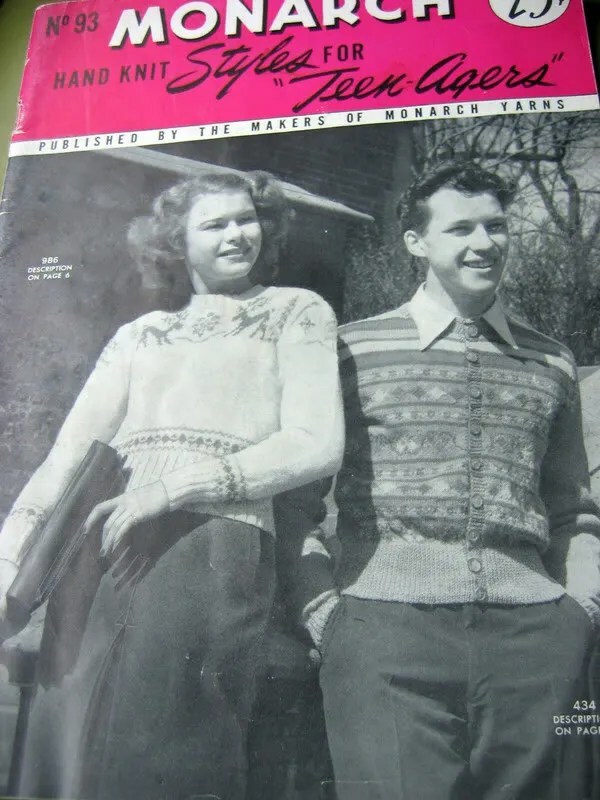 This is my favorite sweater from the issue – other than the slightly blouson waist, I think it looks just like something that would show up in a magazine today. I love the cowl neckline. 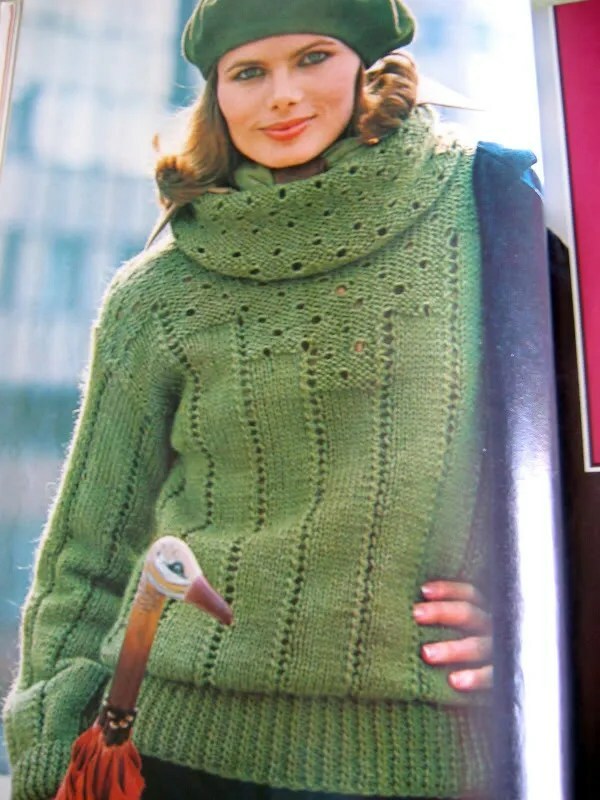 This lady, wearing a crocheted pullover with knitted accents (ie the entire neckline) looks more of her time. Isn’t that scarf snazzy? I love it, and kind of wish this sort of thing could make an occasional comeback. If this sweater were from the 80s it would have had enormous dolman sleeves. 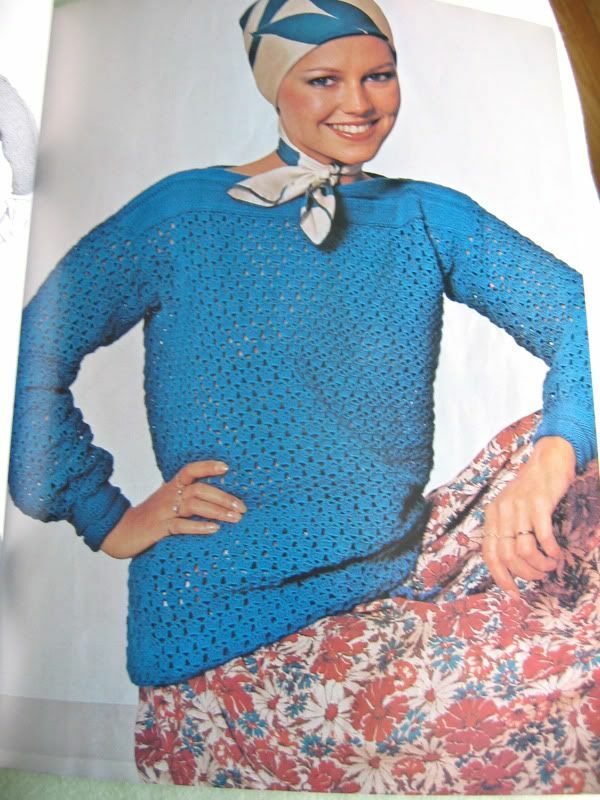 I think this sweater looks very much as though it could be featured in Vogue’s inevitible colorwork story. Actually, it looks less crazy than that section often does. It also looks cozy, and I’m down with the color combo and the pockets. a sweatercoat! 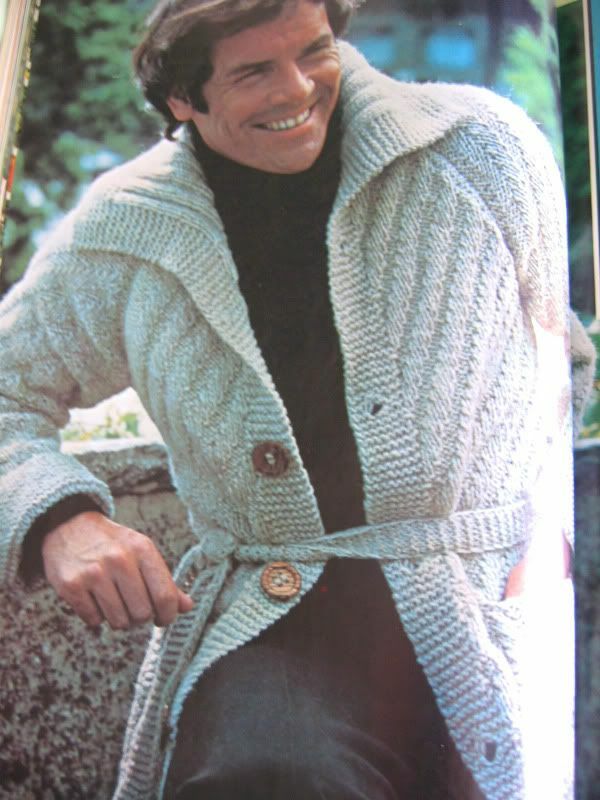 I think more men in my life need sweatercoats, although I really want to reach into the magazine and button those buttons! I suppose men don’t really wear sweatercoats anymore. 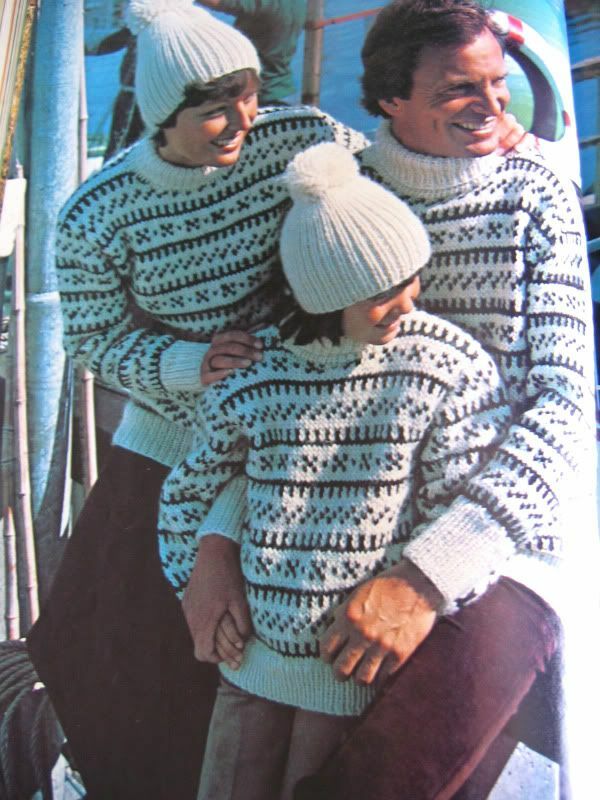 In fact, I know very few who would even wear a sweater, making the scenario below unlikely. Children often get the worst of things. 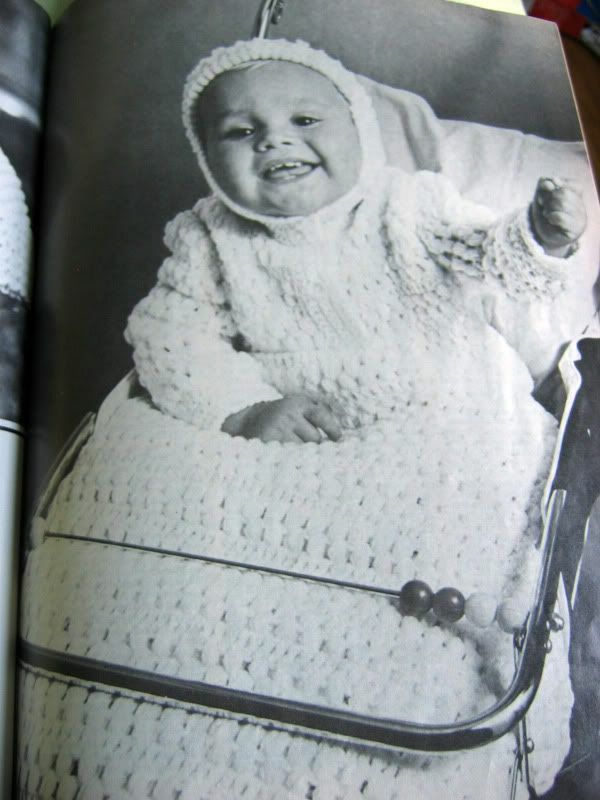 This child seems to instinctively realize the pain of wearing a crocheted sack. This baby is being eaten by his hooded blanket. This is also the least safe looking crib (is it a crib?) that I have seen in some time. There aren’t too many ads in this one, since it’s a special issue, but there is one of note to me. 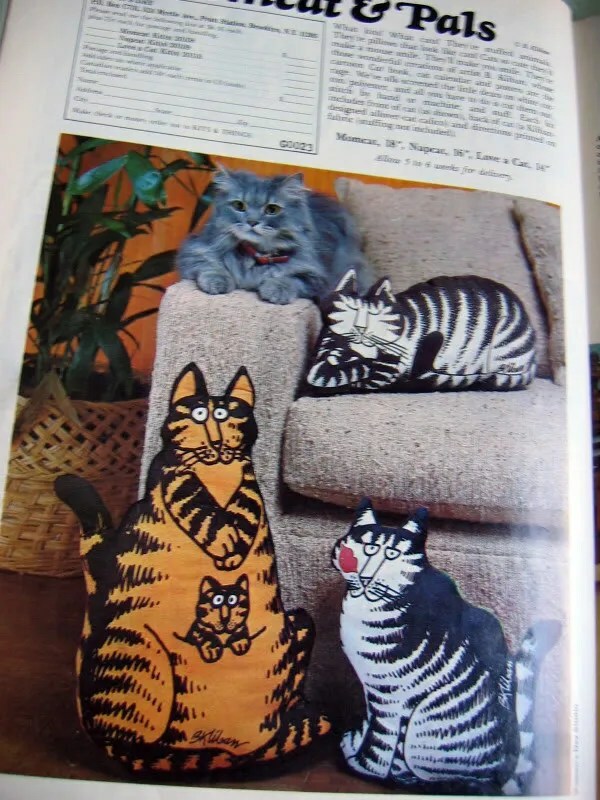 The top says “Momcat and pals” and you can send away for a kit to make one. Apparently they are based on a comic by B. Kilban. I had one of these as a child (the one with a kiss on his face.) I wonder if someone made him for me? 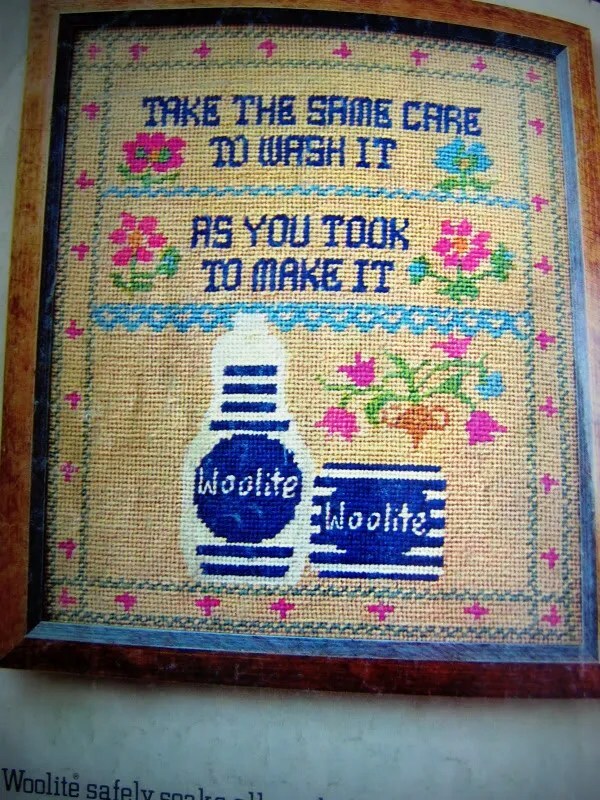 Must ask Mom… she used to sew a lot. I named him Gary (also my Dad’s name) and carried him everywhere. I would love to have one now! 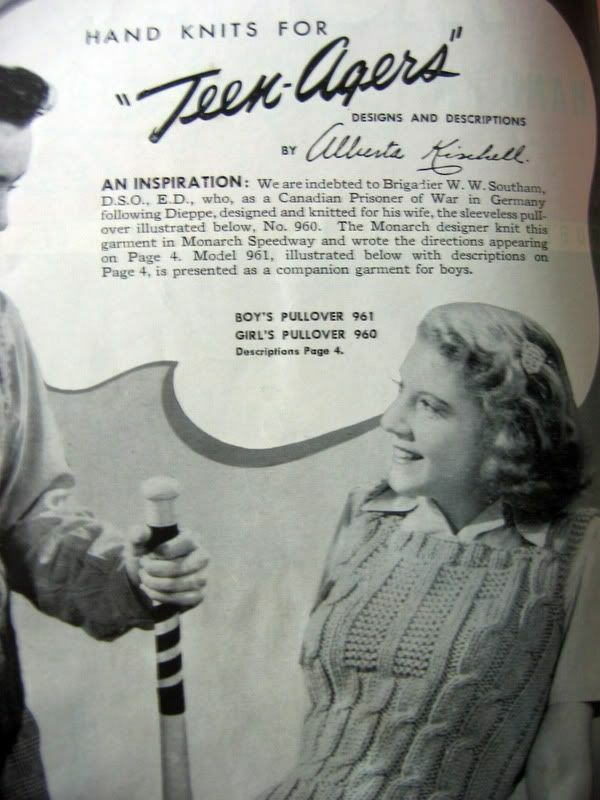 I’ll try to be back next week with another book – maybe one of my lovely 1940s ones? I enjoy the excuse to go through them!